Scritch was my 3rd commission from Arend Studios Again due to the favourable exchange rate for the Canadian dollar and the ease of working with Whitefox made it a good place to get things from! This time I was a little better prepared by getting a proper character sheet designed. The idea for Scritch was for him to be a very fluffy, bouncy energetic doggy so the Monteray Mills White and Palomino fox furs were used as these are about 2 inch long. He was also to have a springy tail. The comedy design brief was that "I wanted something to knock things of tables when I walked past" This was indeed possible as in the tail construction is a plastic rod in the middle of the tail to keep its shape. 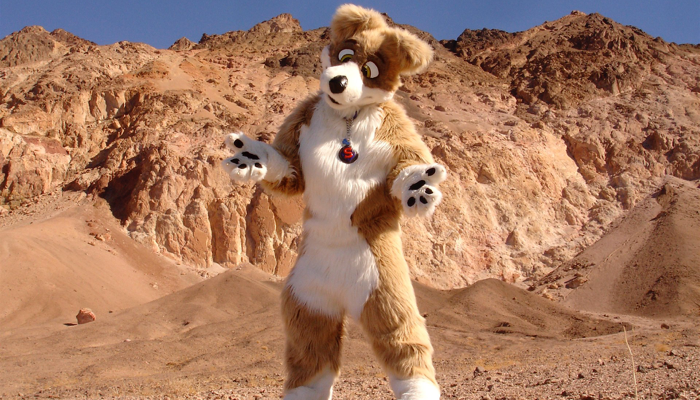 Scritch was the result, Made by Whitefox from Arend Studios in 2004.